There is one cloud phenomenon that has captured the curiosity of many because of its awesome but strange appearance – the fallstreak hole clouds. But what are fallstreak hole clouds? And what could be the explanation behind its bizarre form? Is the formation of a fallstreak hole cloud due to a natural phenomenon or something else entirely? Find out more here. Fallstreak hole clouds refer to the type of clouds appearing as large, oval or circular hole on a thin layer of puffy clouds. It is so named due to the unique cloud formation inside the hole. Its occurrence is often ascribed to UFOs or unidentified flying objects because of its unusual appearance and uncommonness. However, the more earthly explanation credited for its existence is the passing jet that disrupts cloud layer stability causing evaporation, thus resulting to a hole. Other names for fallstreak hole clouds are cloud hole, sky hole, canal cloud, punch hole cloud and hole punch cloud. At What Height is Fallstreak Hole Clouds Found? Fallstreak hole clouds are mid or high elevation type of clouds, just like altocumulus and cirrocumulus clouds. Generally, they develop at 20,000 feet above the ground and are largely composed of super-cooled water droplets and ice crystals. When the atmosphere is at the right condition and an aircraft passes through the cloud, it may bring light rain. Sometimes, when the water droplets freeze, these may fall as snow. What do Fallstreak Hole Clouds Look Like? These cloud formations mainly appear in circular shape. However, they may also come out as pentagrams or star pentagon, oblong cigar and smooth lines of various fallstreak hole clouds put together. As fallstreak hole clouds form, cloud filaments will materialize in the center appearing like curling braids of clouds. There are times that these clouds are found all over the place; sometimes they may appear like an unyielding group of white clouds connected to the main filament. How is Fallstreak Hole Cloud Formed? Fallstreak hole clouds form when the temperature of water within the cloud is below freezing but is still in liquid form due to inadequate ice nucleation elements. When part of the water begins to freeze, it will bring out a domino effect inducing the nearby water vapor to freeze as well. This will descend towards the earth, hence, leaving a huge circular hole on the cloud. Fallstreak hole clouds typically last long and are big enough to make them visible for several miles. It is believed that the disruption of stability in the cloud layer triggers a domino effect of evaporation resulting to the creation of the hole. The atmospheric disruption is often due to passing jet plane in the cloud. How common are Fallstreak Hole Clouds? 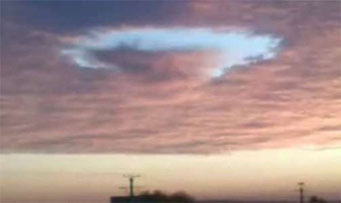 While fallstreak hole cloud formations are generally uncommon, there have been famous sightings in Moscow, Romania and Florida in the United States. Because of their bizarre appearance and rare emergence, fallstreak hole clouds are often thought to be the result of extraterrestrial activity. Some even refer to these cloud formations as crop circle clouds or UFO clouds. Consider yourself lucky if you happen to see fallstreak hole clouds as these fascinating formations in the sky are rare. There is no need to concern yourself with UFO’s or alien activity since the generation of these clouds can be explained by science.